Nathan Green grew up in the Newcastle suburban town of Toronto and bizarrely he captured his first PGA Tour win in the greater Toronto area of Canada. But somehow this talented golfer has been unable to break free of Toronto with Green last year winding up in dead end street without full Tour playing rights. However after regaining his card through the Tour School the Novacastrian explained to Bernie McGuire his determination to again get back to a pathway to golf’s greener pastures. 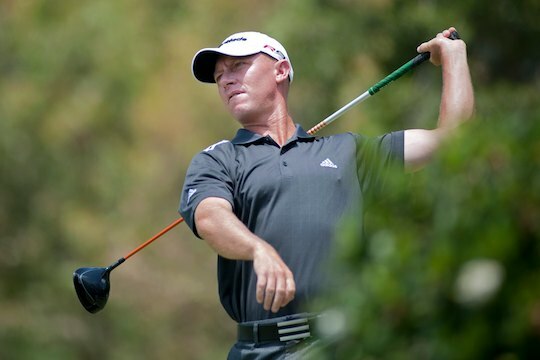 Seven days prior to competing in the 2009 Canadian Open Nathan Green was staring at the prospect of losing automatic playing rights on the PGA Tour. He was lying well down in 133rd place on the money list and with a best before heading to Ontario of 12th in his very first event of 2009 – the Hawaiian Open. But that all changed when Green shocked double U.S. Open winning Retief Goosen to capture Canada’s premier event in a play-off. And could there have been a better storyline that the guy from Toronto Australia winning for a first time on the PGA Tour in the greater Toronto area of Canada. Success also in the Canadian Open was doubly special for Green as it was his first victory outside of Australia or New Zealand since winning on the Canadian Tour in 2000. Green earned a two-year PGA Tour exemption till the end of 2011 in winning the Canadian Open but for the last two seasons it’s been his PGA Tour lifeline. In 2010, Green competed in 27 events but had only one top-10 while he missed the halfway cut in 11 and finish the season in 121st place on the money list with earnings of $US 636,180. But Hunters and Collectors fan was collecting any decent size cheques. His troubles deepened with Green missing the cut in the opening three events of the year and ending the year well outside the top-125 by 40 spots with a best of 23rd in the Valero Open and also sitting out the weekend rounds in 14 of 26 tournaments. The dream that had unfolded on that Sunday afternoon 26th July, 2009 was now but a memory. And seven years into a career on the PGA Tour it comes as a surprise with Green, who turns 35 this month (May 13th IF MAY EDITION), confessing the tell tale signs of a down turn in his game were also present that week nearly three years ago in Ontario. “When you do win a big tournament like the Canadian Open I guess you do expect a little more of yourself but just like any player I would have liked to go on with it,” he said. “It’s just been a tough two years and that part of my game that used to be my bread and butter, namely chipping and putting, has pretty much deserted me. A second lifeline was presented to Green just prior to Christmas when he closed with a six under par 66 at the PGA Tour School PGA West in Palm Springs to finish in a share of 27th place and be hauled back on the PGA Tour mothership. “I thought it was done and dusted at the end of last year that I wouldn’t get back on to the main Tour but I went to Tour School and not thinking I had a chance and played really well in the last round to win back my card,” he said. Up to the recent Shell Houston Open Green had contested five events and made the cut in four. Holding back the father of 11-month old son Taylor is the uncertainty of regular competition given his PGA Tour category. That was the case in Houston with Green only finding out he was into the $US6m event on the Friday before competition and fortunately as he lives in Dallas it was only a short drive to America’s fourth largest city. “I just haven’t played two weeks in a row out here on the PGA Tour this year so that why I played the Nationwide Tour event last week,” he said while in Houston. When Green won the Canadian Open he was asked if there was any resemblance to Toronto, Canada and his hometown of Toronto, Australia. “Toronto is just a small suburb that’s part of Newcastle and it’s sort of got one main street,” said Green. Green now resides in sprawling Dallas, Texas but he’s still a small hometown boy at heart and where Toronto, Newcastle is still very much in his heart. And whether it’s Dallas, Houston, Boston, Chicago or again Toronto but hopefully Green can again find that main street that will lead him to further PGA Tour success. Nathan Green: Where’s He Been?